As the CBC reports this morning, “if you missed last night’s total lunar eclipse, here’s some good news – there will be another one in October. 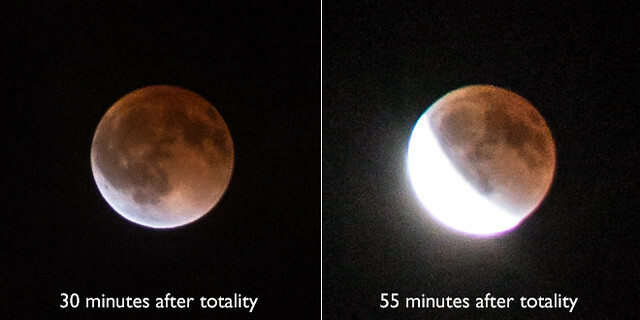 Fortunately, Monday night’s eclipse is the first in a tetrad — a series of four total lunar eclipses separated by roughly six months each. The next one takes place on October 8th, peaking at 3:54 am PT. You’ll only be able to see the whole eclipse if you live west of Regina and Saskatoon, as the moon will set before it is complete in the rest of Canada. However, the peak of the eclipse should be visible almost right across the country. Follow the HR MacMillan Space Centre in Vancouver on Twitter and Facebook for more information about special viewing and learning events. I set my alarm so I could get out and phootgraphy the eclipse. Too bad I woke up to an overcast sky. 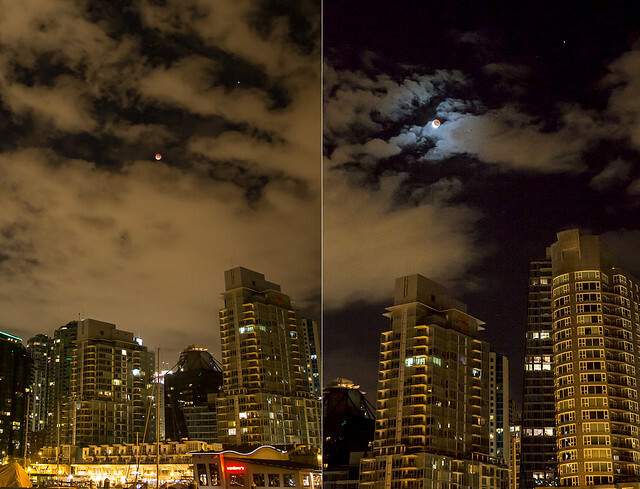 Nice to see that some people in the lower mainland area were able to get some photos though.